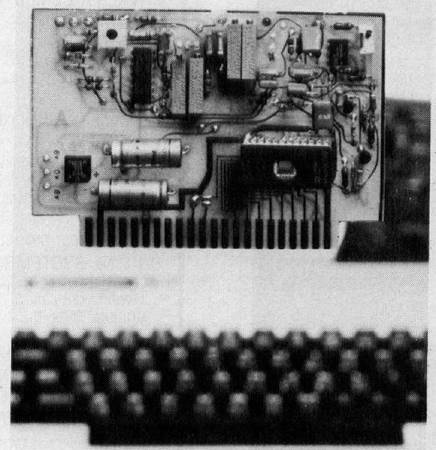 Computer World in the Netherlands developed an interface between the standard VIC-20 computer and a radiotransmitter or receiver. It's easy to use. You plug it in the back of the VIC, or, if you have an expansion unit, it can be put in the expansion unit. The 4K machine language software is in EPROM. On the card you find a Morse and RTTY converter and decoder. You only need the output from a loudspeaker or headphone. You can either transmit or receive RTTY or Morse signals. On RTTY you have all baudrates — i.e., 45, 50, 57, 75, 110, 200 and 300 Baud. There are three programmable buffers, each of 150 characters. Five buffers are pre-programmed, with: Station description, CQ call, CW ID, Auto-start message. The user can call each of these messages with the functions keys. The Morsedecoder reads every message in Morse code between 67 to 60 words per minute. The callsign of the user will be transmitted every 10 minutes in Morse code. There is also a version for users who have an RTTY converter.